Proudly sponsored by Protect, our 100km road ride is our most exciting and challenging of the road rides. Your skill and fitness level must be second to none and your appetite for a challenge strong! This ride provides bragging rights as you take on part of the WORLD RENOWNED Australian National Road Cycling Course. The ride will see you cover everything from quiet undulating country roads through to the challenge of the Mt Buninyong highway climb in addition to Mt Egerton hill. Experience the views from Mt Buninyong east towards Melbourne, and then ride through the fertile volcanic rolling plains back to Ballarat. You will see fields of irrigated potatoes, sheep and cattle grazing and be part of a truly unique experience. The course for the 100km road ride goes through Gordon before heading north into some of the most pristine riding anywhere in the country. 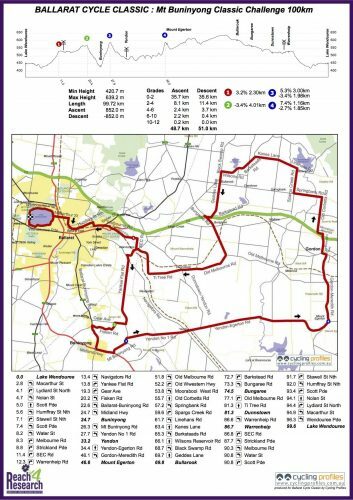 All ride options come together in Dunnstown before re-entering Ballarat for the return route up Macarthur Street followed by a clockwise ride around the lake back to the Cycle Classic Precinct in Windmill Drive. Dust off your bike and start training today! You will ride the WORLD RENOWNED Road National Course.